EDITED: Guess who got a little under the weather today. Part Two will show up later this week. This week's feature comes to you in two parts as Part One was sick and Part Two was only halfway dressed and ready for the Mr. to take their photo when he arrived home from his drill weekend lunch break. By the time Army guy got home for good it was dark and Part Two was worn out and Part One just wanted to growl at the dinosaurs and give them kisses. Part Two plans on being back in action for Monday evening and promises to look into a camera remote for Christmas. Ruby did look rather adorable despite her temperature. She woke up from her morning nap feeling hot and looking rather pitiful but we got plenty of cuddle time in to comfort and distract her and she was asking for solid food again by the end of the day. I can't tell you how much I love that she can sign for what she wants but it was especially evident today that there was only one thing on her mind while she was feeling under the weather! I took these photos right after she woke up from her nap. I had to distract her with her baby doll to look up for me and it wasn't long before she started signing 'milk'! 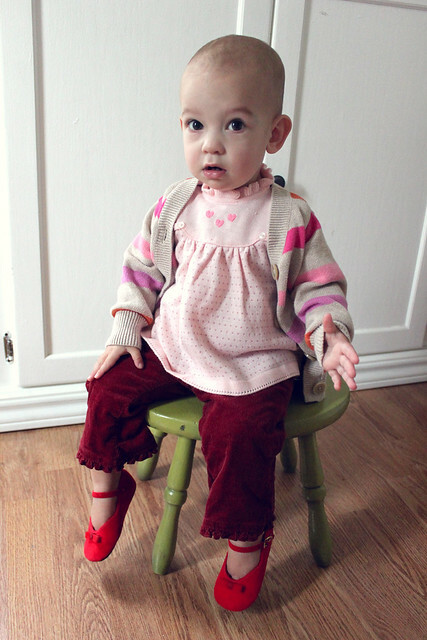 Her top is actually a dress that I wore when I was three months old as seen in the photo below. I had a hard time getting it over her head but it still works well as a top. 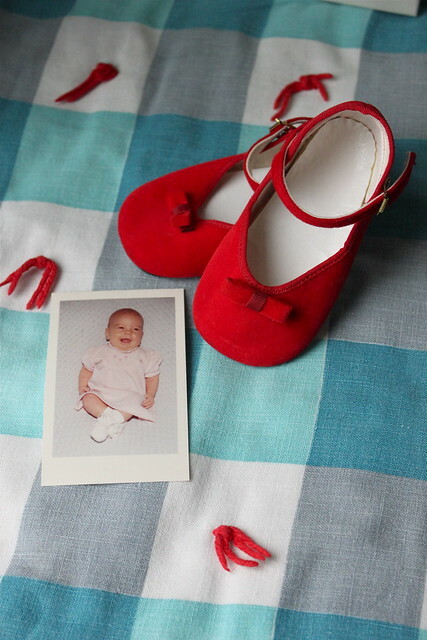 The shoes are the same ones she wore at her birthday party that belonged to me when I was about her age. Here is Ruby at three months. A few of my favorite Etsy shops full of vintage kid's clothing are Hart and Sew, Oh Sydney, Freckle Wonder, and The Fancy Tail. I like to search through Etsy every week with the keywords 'toddler' or 'baby' and 'dress' to see what has been listed and then I favorite things I love and need to think about. I always take into consideration how much it will cost once shipping is added, if it's special, if it'll fit her in the right season (although you can really add a cardigan to anything for the winter), and if it's something I might not find locally. What are some of your favorite vintage kids' stores? Do you have any tips for finding what you're looking for online? We'd love to hear! Stay tuned for Part Two and don't forget to head over there to see what Miss Rubyellen has posted! Love the picture of you both at 3 months. 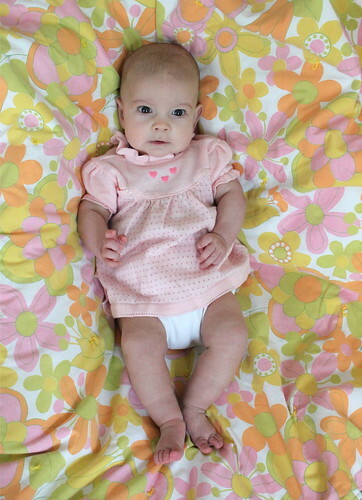 In my daughter's 3 month photos, she is wearing the same dress I wore at that age. Both of my children wore the same christening gown my sister and I wore. For my son- he only wore the undergown with a simple white sweater that was given to us as a gift. I love when children wear clothes that their parents wore. That's awesome that you still have those from when you were a baby! My sister wore my hand me downs, but I only have two dresses and a purse left for our daughter. She is adorable! I love her outfit & those cute shoes! Miss Ruby can I just give you a big hug?!! I totally remember that sweater you bought her when she was still in your belly! And how sweet is that dress that you once wore! makes it all the more special! um, can i have that outfit in my size, please? totally adorable. 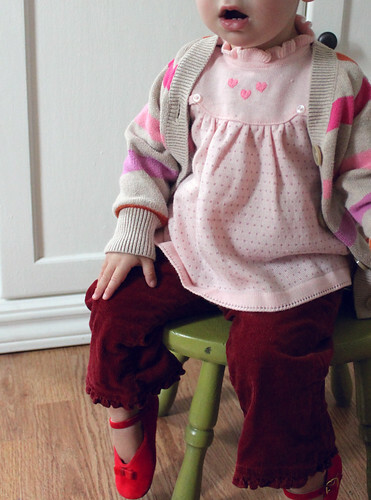 i love vintage kids clothes & although it's sometimes harder to find i've been able to collect a few great pieces. no vintage store comes to mind that i know of that specializes in vintage kids clothes; from the ones you've mentioned already. 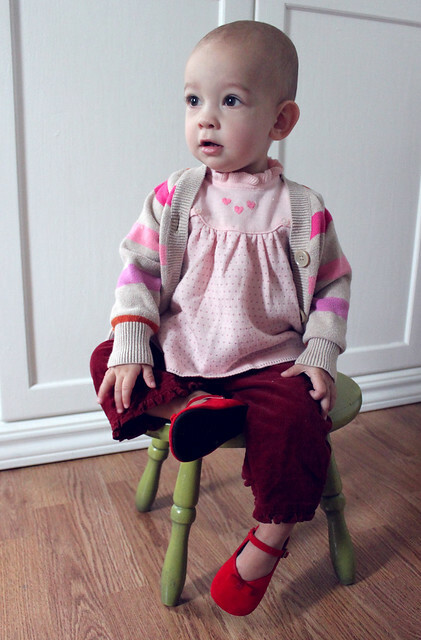 but i'll tute our own horn and say that Misha LuLu is one of the cutest hand made, retro looking kids clothes around. right now we are developing fall 2011 and i am drooling over some of the pieces we are designing. you will love it! i can't reveal to much but it is strongly influenced on a certain era. we also have a cool surplus store with lower priced adorable dress's. love your blog and your kids are so adorable. i heart being a mom!! I have pictures of both my dad and I wearing the same little Stanford sweater when we were babies. Adorable. Oh Rachel, Ruby is so cute and adorable. So cute! I've always wondered how I would dress a little girl if I ever had one since I'm not too thrilled about the idea of ultra cutesy clothes on kiddos. These vintage pieces that you mix in are perfect! My amber necklace arrived the other day, I hope my wee man looks as cute in his as Ruby does in hers. And now that I know about them I've seen them on a couple of babies and the mothers have said they really work. Cheers. oh my goodness, those cords are adorable! i want some!! my favorite vintage shop is my grandma's home. she has dresses that belonged to my aunts, scarves that were my great-grandma's, wonderful bags... every time i go there i come back with something. the best part is that she kept my clothes from when i was a baby, so now l. can wear the same dress i did when i turned one!